Some see the touch interface as the next big thing in personal computing, while others view it as a gimmick that won't replace traditional input devices anytime soon. I'm split on the issue. The success of Apple's iPhone proves that touch, if done correctly, is a great way to navigate a digital device, particularly one that's handheld, petite, and portable. Microsoft is bullish on touch and has been developing the technology for several years. In 2007 it unveiled its Microsoft Surface technology, a multitouch tabletop computer that may ultimately find a niche market in government, educational, and health-care kiosks. And a year ago it demoed touch features it's adding to Windows 7, which will ship this fall. For a demo of Win 7's multitouch skills, check out this video. Microsoft Surface Globe: Based on the demo video, this app looks like the best thing in the Touch Pack. Navigation is a natural for touch screens, and Surface Globe, with its Virtual Earth 3D engine that lets you rotate around 3D models of buildings, makes Google Maps look low-tech by comparison. Perhaps Microsoft should incorporate Surface Globe into its upcoming Kumo search engine. The move might spur sales of Windows 7 multitouch PCs, and give people a reason to try Kumo instead of Google Search. 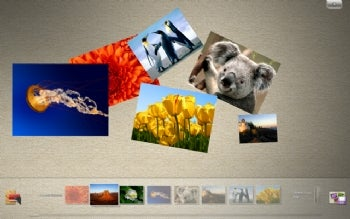 Microsoft Surface Collage: The ability to resize and organize digital photos is another great use for touch, and that's what Surface Collage offers. I'm not sure if the app includes simple image-editing tools such as cropping, but it should. Microsoft Blackboard: A physics puzzle that lets you use gestures to build a virtual machine of gears, fans, and seesaws. Microsoft Garden Pond: Gently move your origami creations in a virtual pond. Microsoft Rebound: A game where you "propel a ball and annihilate your opponent" on an electrified court. Microsoft Surface Lagoon: A screensaver where you use multitouch to interact with the fish. Will multitouch someday make the keyboard and mouse obsolete? Not in the near future, certainly. But it's bound to play an increasingly important role in human-computer interaction.